Theological Discussion about Sin and Redemption – Tuesday April 16th at noon. We will have some soup, Sheila will provide some food for thought, followed with some conversation! 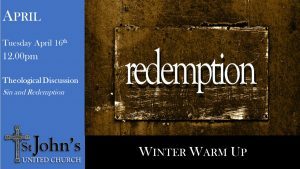 Hope you can join us for this last winter warm up event!